The girls had their end-of-year concert for Russian school at the beginning of June. The dress code was "black and white." Neither of them had anything that would work except for a single long-sleeved white cotton blouse between them, so I headed to the stash. It was clear to me from the outset that this particular fabric needed to be sewed up into this particular dress. The pattern is #30 from Japanese book 9784579111848, which is actually in Japanese so I don't know what the real title is. I've made the pattern a few times before. 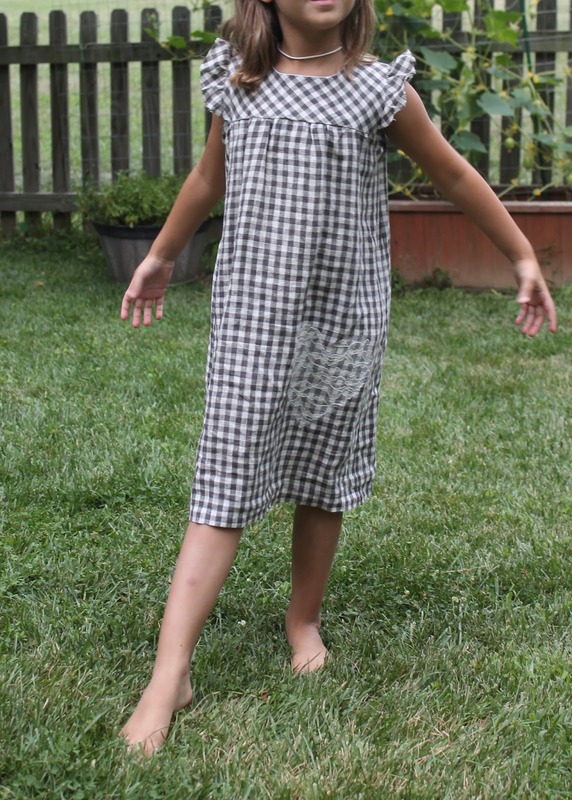 Z actually still wears the brown linen dress I made her three years ago. It is a long top on her now and will still fit next year. That was a size 100 but without seam allowances (since I forgot to add them). This time, I used the same size, but remembered to add the allowances this time. I lengthened the bodice pieces about 3/4", though I wish I had added another inch. I also lengthened the skirt part about 10" (I wish I had also widened it just a smidge), and fully lined the bodice with white cotton shirting since the linen is a bit scratchy. 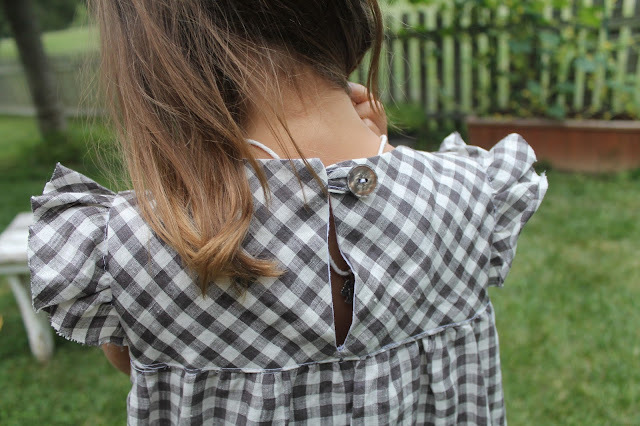 My regular machine was in the shop when I sewed this, and as my back-up doesn't have an automatic buttonhole function, I also had to convert the back bodice from buttons-and-buttonholes to button-and-loop closure. Even with all those changes, I was able to sew this up in a couple of hours. I cut the flutter sleeves on the bias and decided not to finish them. 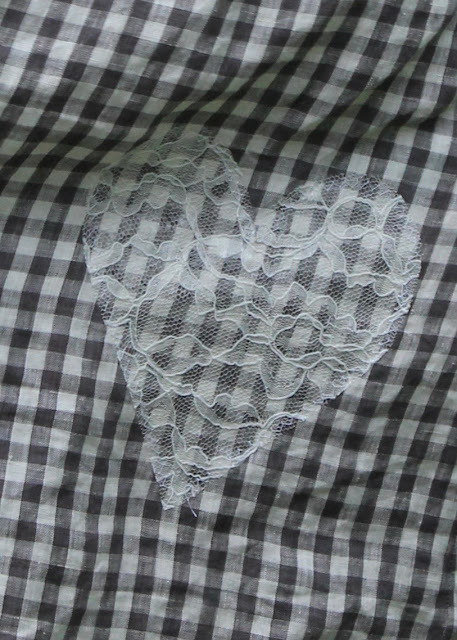 You can see the very slight fray at the edges in the above photo - this was after the dress had been worn and washed several times, so I'm glad I didn't finish them. I like the slightly raw look and think it compliments the style and fabric. The bodice is very short, and while I was constructing the dress, the large expanse of the skirt was positively calling out for something to break it up. I briefly considered pockets, but then I stumbled on some cream-colored lace in the stash. On an impulse, I quickly cut out a heart-shaped applique. I wasn't sure how my fusible web would work to applique lace, but it worked just fine and doesn't obviously show through. I stitched around the edges of the applique with a zig zag. I LOVE this detail. I just adore this dress. I'm so happy that Z is willing to wear gray and white checked linen. There were definitely a few years where I wasn't sure my girls would ever wear anything that wasn't the color of cotton candy. Thank goodness that phase is over. For Natasha I found a cut of black-and-white floral crepe voile from the stash. 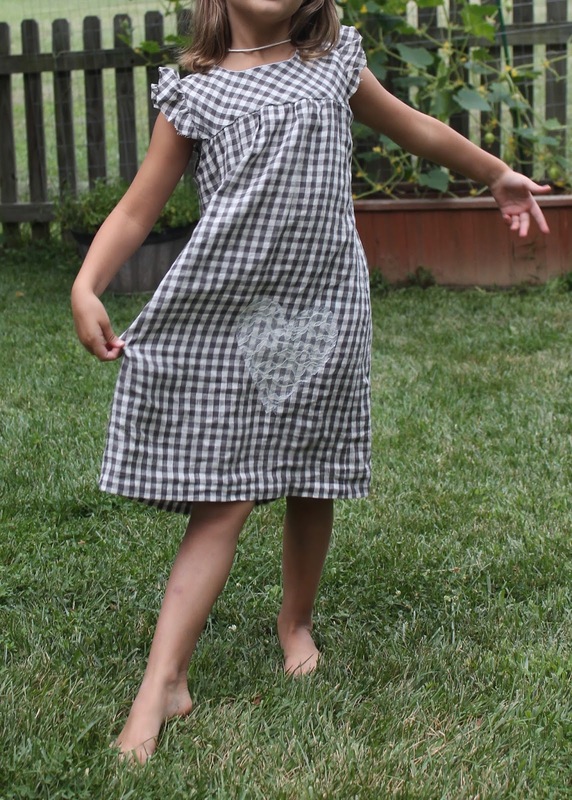 She requested a skirt, so I decided that the voile would become an Oliver+S Onstage Tutu Skirt. I've made this pattern four times before, though I've never blogged any of them. It is an easy sew. 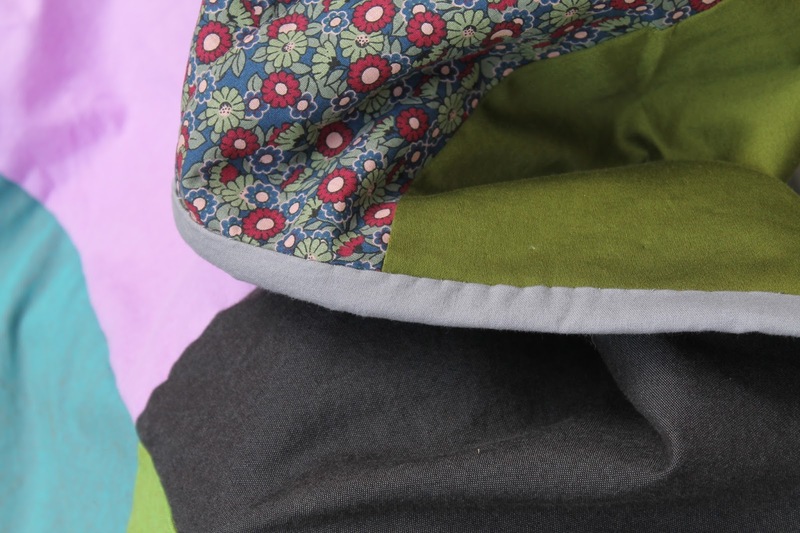 The lining becomes the waistband so you need to choose a fabric without a wrong side for that piece. I used a very lightweight white cotton shirting. I finished the voile with a rolled hem in black thread. 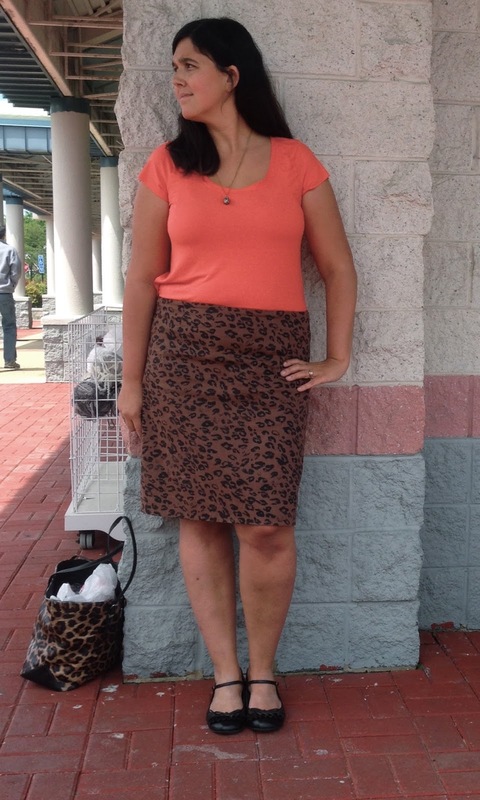 Gathered skirts like this one look so cute on Natasha. She wore it to the graduation with the lone white RTW blouse (which is actually a bit too small for her and has since been retired). 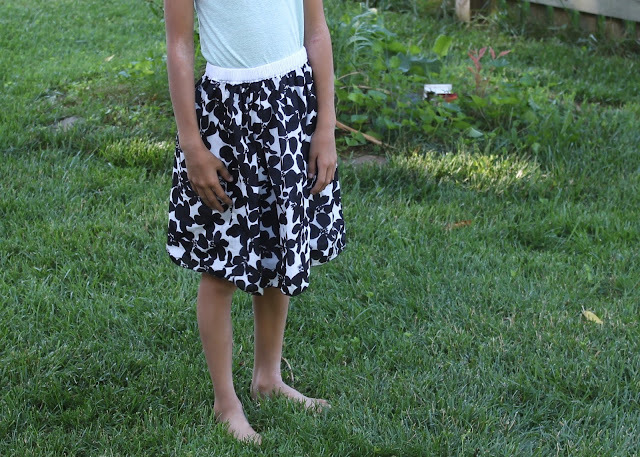 The photos we took that day didn't turn out very well, so these reflect how she has chosen to style the skirt since. On her own, she has decided that she likes her blouses tucked into full skirts. I love that she has developed her own style preferences (I guess it's easy for me to be happy about that since they are tasteful, for now! ), and I will happily sew her a bunch more gathered skirts so that she can continue indulging them. 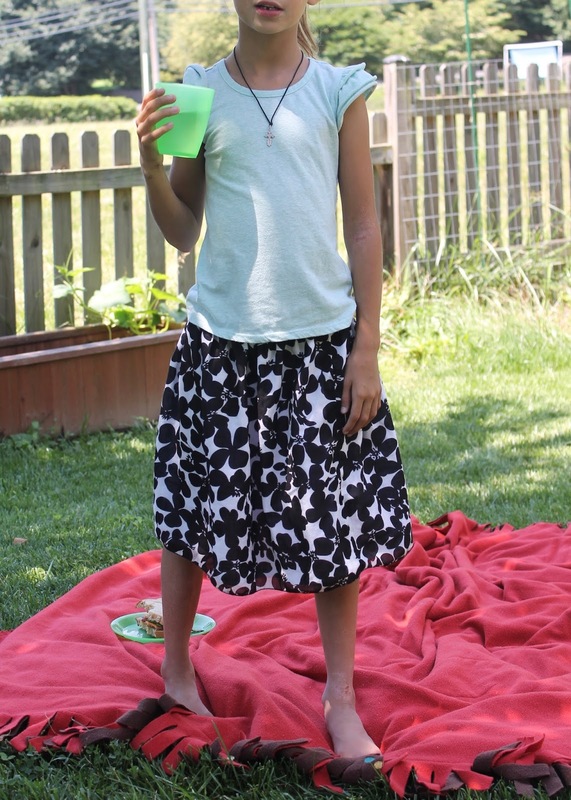 The skirt is really versatile, too. It works dressed up for church, and with a t-shirt for a lazy backyard picnic. Both pieces are still getting worn regularly and should fit for another year or more. I love occasion sewing that ends up in workhorse wardrobe pieces! 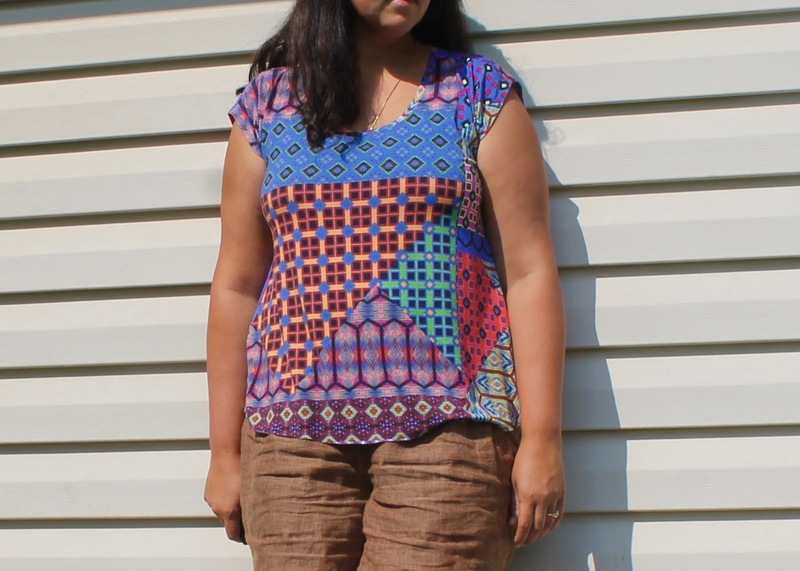 The Maria Denmark Kirsten Kimono is my TNT knit t-shirt pattern. I've hacked up the pattern quite a bit, lowering the neckline significantly and doing a dartless FBA and a forward shoulder adjustment. The pattern has worked very well for me in general - I even used it to make a few maternity tees last year. Earlier this summer, though, I made a couple that were too tight in the tummy and hips. I'm still wearing a few other tees made with the same pattern pieces, so I surmised that the fit issues had to have come from the fabric. In any case, after the second unwearable tee in a row, I got a bit frustrated and decided to alter the pattern again to make the shape a little more swingy and thus more forgiving of varying stretch percentages. 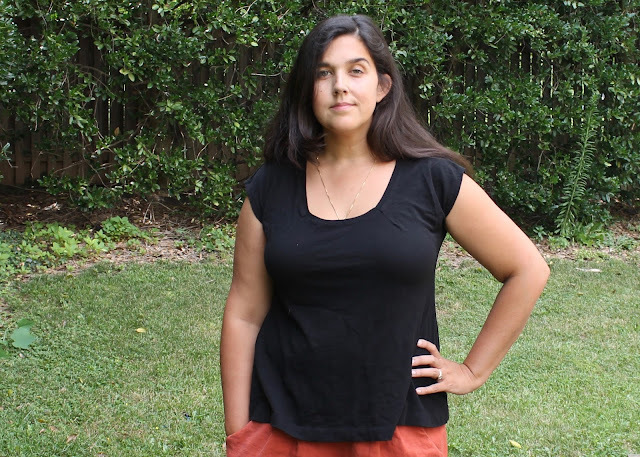 In order to turn my pattern into a swing tee, I slashed and spread the pattern from the hem to the narrowest part of my rib cage - this was important because I did not want the fabric waterfalling right off the top of my bust; I needed to keep the negative ease down through the bust to avoid a maternity look. I think I succeeded at that. I slashed and spread the back pattern too, but not as much as the front as I wanted it to be a bit more fitted. I cut my first out of a black cotton slub knit from Fabric Mart. I had a good bit of gaping after I sewed it together. I initially blamed this on the fabric. I ended up taking a 1" dart in the back neck, tapering to nothing about four inches down. I also had to take two 1/4" darts out of the front neckline. It fits perfectly now, so I went back to my pattern and removed the excess so that I wouldn't have to sew darts in the future. In my Google research since then, I have found that the problem is most likely my free and easy lowering of the neckline - apparently you can't just scoop out a neckline, you have to "contour" it, or you get the gape I'm kvetching about here. I haven't been able to find any good online resources to show me how to do this (other than the general "remove neck gape" tutorials) so I think maybe it's time I invest in a proper fitting book. 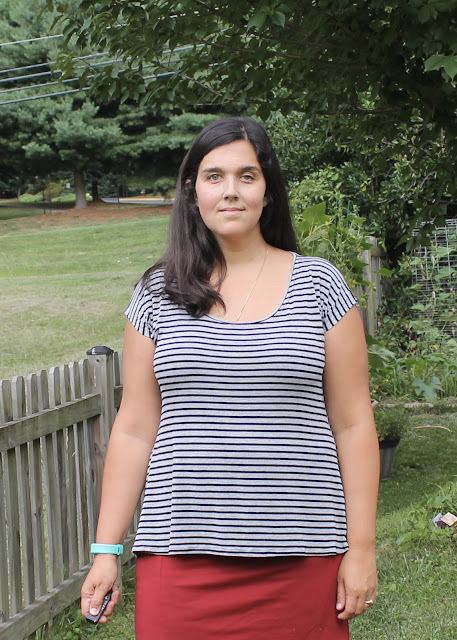 I sewed my second tee out of this Nicole Miller rayon/lycra remnant from JoAnn's. The print is so random that I didn't give any thought to pattern placement other than to make sure that it was on-grain. That faux-yoke on the front is totally coincidental. 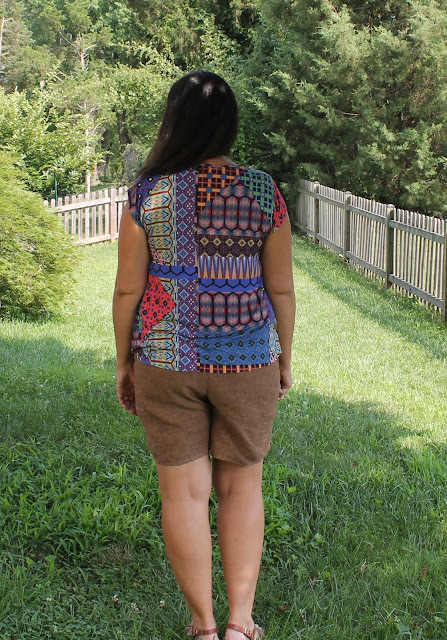 I don't love the huge swath of orange and brown across my torso and kind of wish I'd cut the front out of the part of the pattern that I used for the back. It is a lot swingier than the black tee, something I think is due entirely to the drape of the rayon as opposed to the black cotton slug. 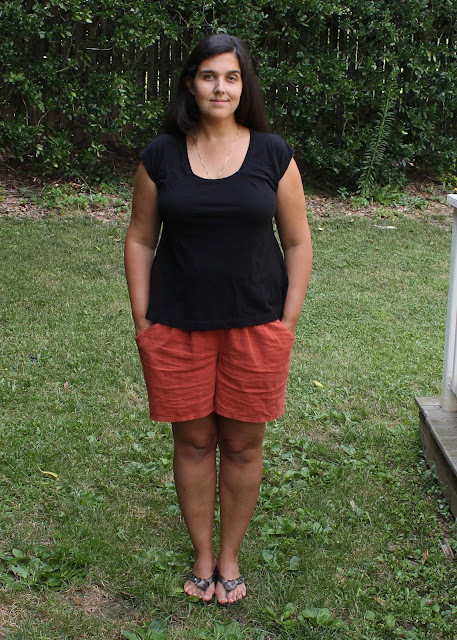 It's really comfortable, and it has so many colors in it that it matches all of the solid-color bottoms I made during my Simplicity 1887 spree earlier this summer. 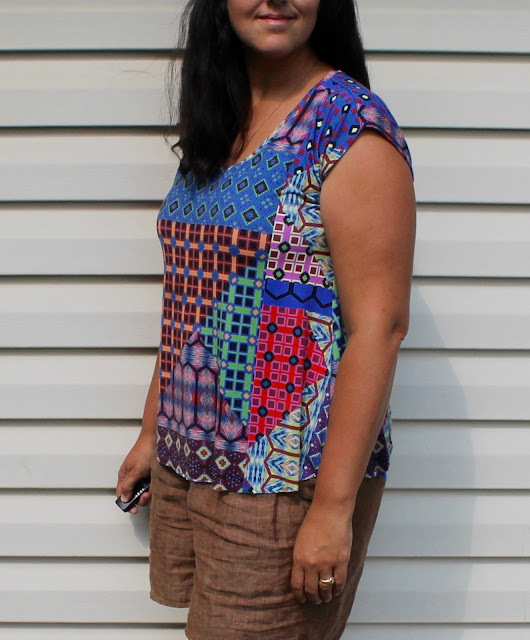 I made the last tee out of a rayon/lycra from Fabric Mart. It's also lovely to wear and - stripes! Not much else to say about this one. I've been wearing these three tees in heavy rotation since I sewed them, and although the fit on the latter two is really quite good, I've noticed that the back neckline is still a bit long for me. I need to pinch out another 1/2" or so from it. When I realized I needed to do that, I started paying a little more attention to the neckline fit on the woven tees I made recently, and found that, there, too, the back neckline is too long. In both of these patterns, I started with my high bust measurement and made FBAs, so in theory the neckline should be fine. 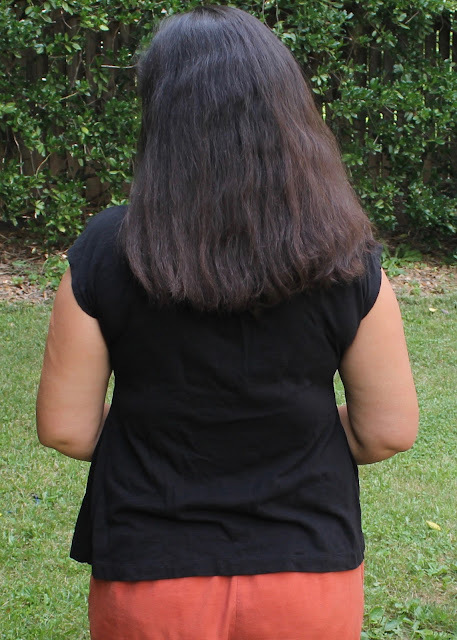 But I'm making a mental note to pay more attention to the back neckline on future muslins, as it seems like it will be a regular adjustment for me going forward. It is a good thing that I rather enjoy the process of fitting - otherwise I think I'd give up selfish sewing! 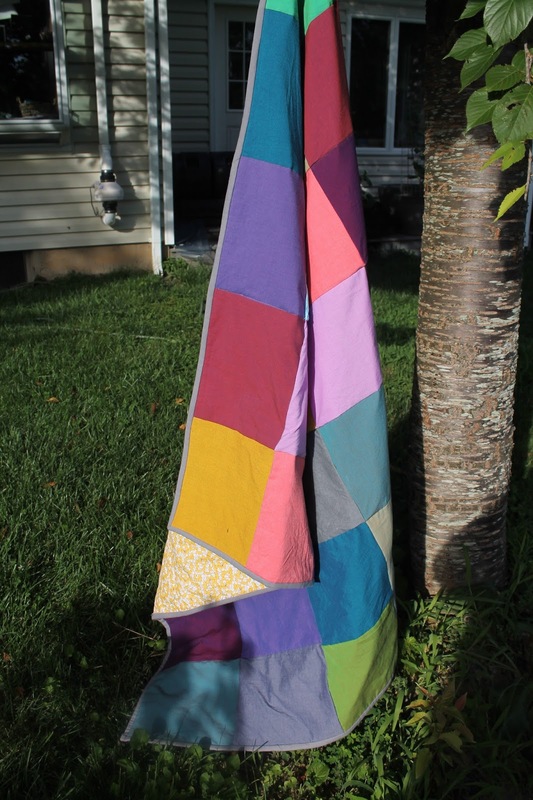 I really love quilts. I think they are beautiful. But I am not a quilter. A very good friend got married last August. The wedding was across the country and given the turmoil in our lives at the time, my husband and I weren't able to make it. This particular friend really values handmade. I knit him a beanie 11 years ago, which he wore constantly. Then while he was living in Mauritania his house was broken into, and along with electronics, the thieves made off with the beanie. (I admit to being a little bit flattered that they thought it was worth stealing). My friend was bereft, so I knit him another one. When he got married, of course I was going to make them something. 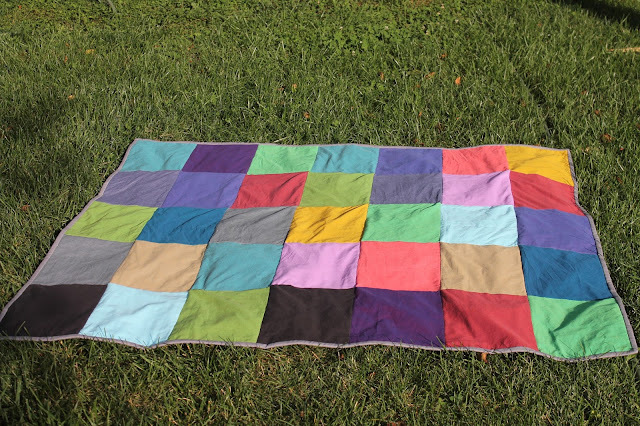 I haven't knit much at all lately, so I decided to make them a throw quilt. It took me quite awhile to get started on this project - in fact, I'm just going to squeak in before their first anniversary. I had this idea in my head of a simple patchwork of shot cottons. So I bought half-yards of 15 colors (the fabric line is Artisan Cottons) and went to work. I cut 35 squares 11"x9" (because that was what I got when I evenly divided my half-yards into square-ish blocks) and sewed them into five strips of seven blocks. I just stitched-in-the-ditch (roughly; I'm really not good at it, I have found) to quilt it. I used Warm and Natural quilt batting, which says you can quilt 10" apart - this was good because I didn't want to do more than that. Like I said, I'm not a quilter. I got some puckers where lines of quilting crossed previously stitched lines of quilting. 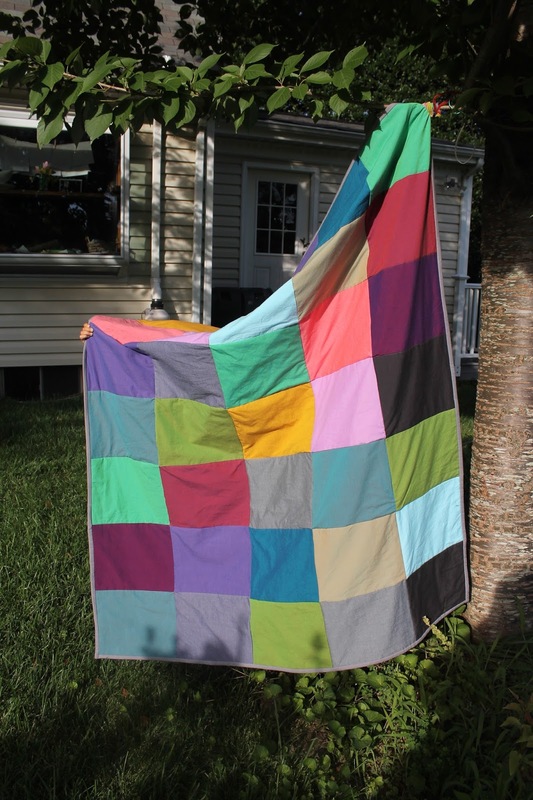 This has happened with all the quilts I have made and it's enough to make me not want to quilt anymore. I know this one is not perfect, but I hope they will appreciate it. 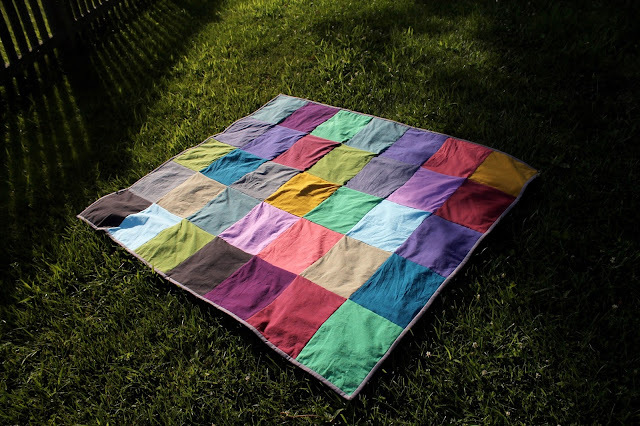 And I'm not going to apologize for my lack of quilting prowess any more in this post. Instead, I'm going to show you what I like about it. I really love the combination of colors. I played with a few arrangements and then ultimately ended up arranging the colors roughly by color families on the diagonal. I took the opportunity of the quilt back to use up some of the quilting fabric cuts I had kicking around the stash. I worried that it was a little too girly but I like the green, yellow and orange together. I finished the binding by hand, and I love how neat it looks. 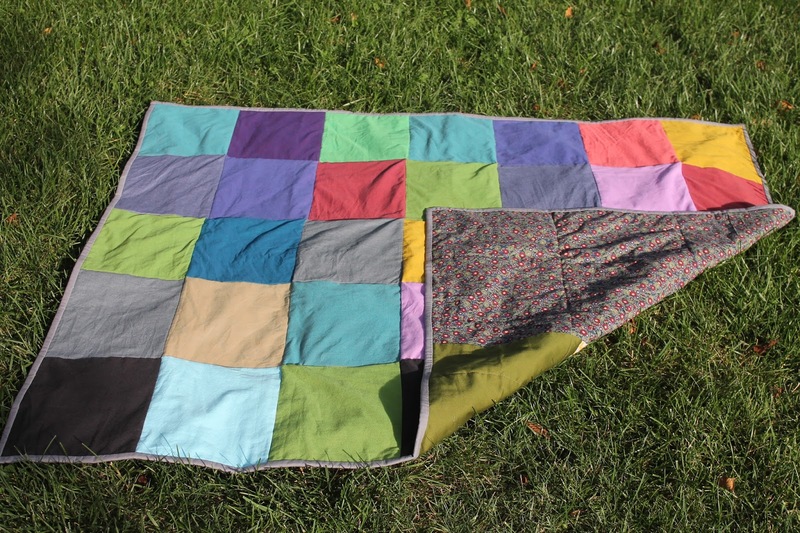 In my humble, non-quilter opinion, it is definitely worth the effort to hand-sew a quilt binding. 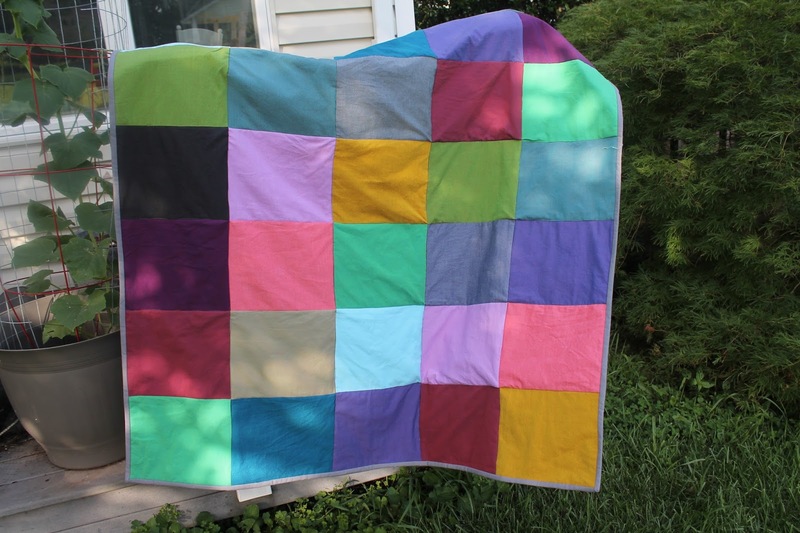 I thought after quilting that I should bind the quilt in black, but I didn't have any black cotton in my stash, and I didn't want to have to run out to Joann's, so I ended up using this medium-gray quilting cotton I had lying around. In the end, I think it looks better than the black would have, especially against the back. 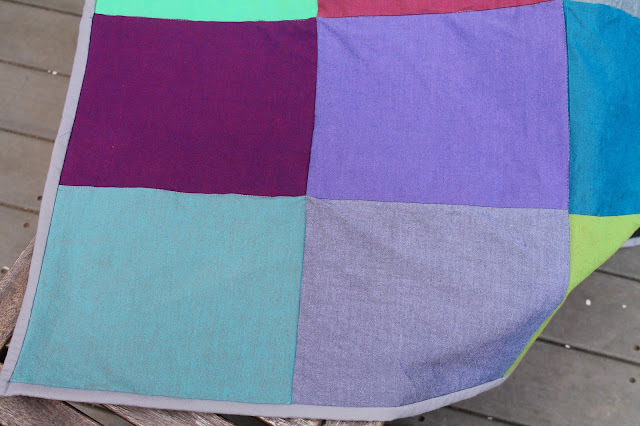 I love looking at different quadrants of this quilt and letting my eyes absorb how those colors look together. 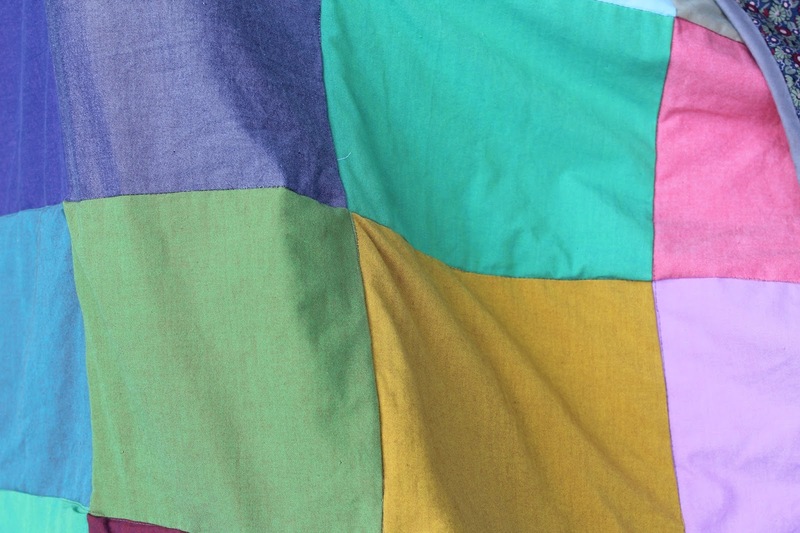 There are so many different moods in these colors, depending on where you look. Isn't the turquoise below gorgeous? It is woven with peach threads to make the shot cotton effect. The photo doesn't do it justice at all. The red/purple above it is also so pretty. I also really love this blue/green/yellow intersection. The quilt finished at 52" by 60" square. It felt so heavy to me while I was quilting it. 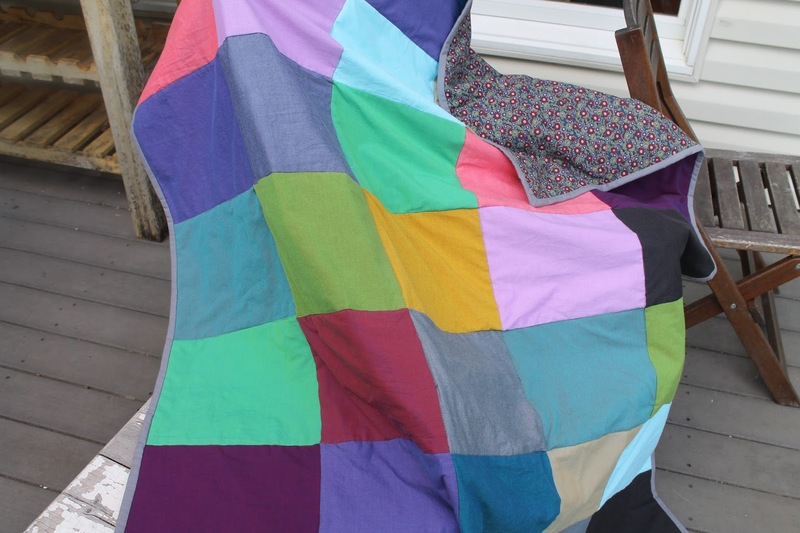 I couldn't understand why, after all, a 52x60" quilt didn't seem like it ought to be much bigger than the roughly 40" square baby quilts I made earlier this year. But then I did the math, and yeah, it's nearly twice as big, area-wise. 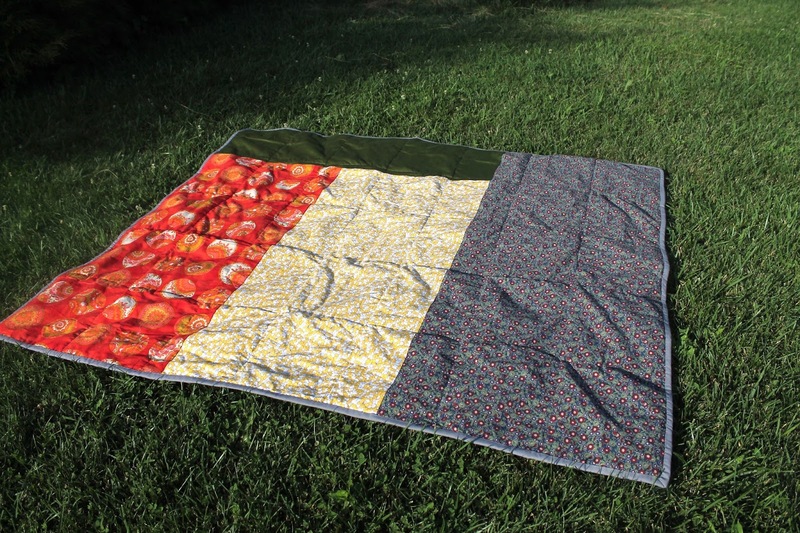 I really can't imagine making a twin-sized quilt on my machine, let alone a queen-sized one. 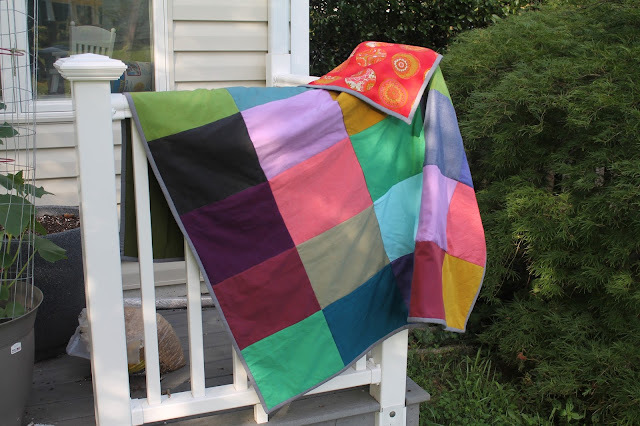 I do, however, have enough of the shot cottons left over to make another quilt, and despite the fact that I am not a quilter, I kind of want to. At least, I kind of want to make the top. I just don't want to quilt the darn thing. I know that I can send my quilts out to be quilted. But I am stubborn and don't really see the point in starting the quilt process if I am not going to finish. Alternatively, there is a local quilt shop nearby that sells time on its longarm machines. I don't see myself doing that either. 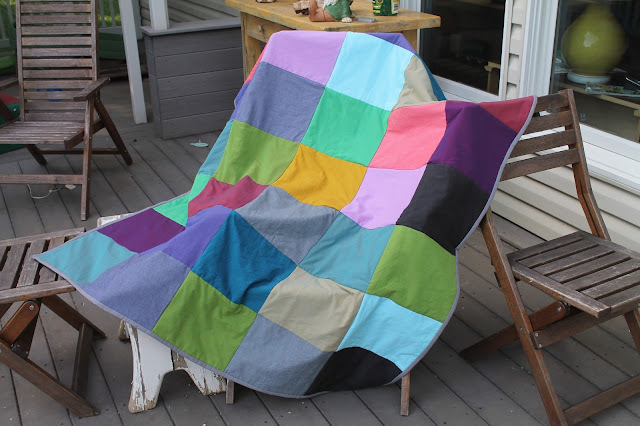 So more than likely, I will probably give in to a quilting urge again in a few months and you'll see me back here with another imperfect, puckery project. I am not a quilter. But I sure love quilts. 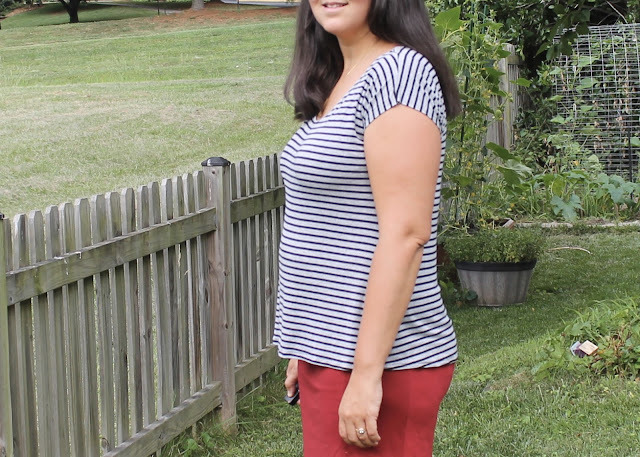 I bought McCall's 3341 when I first began sewing seven years ago (and lived within walking distance to a Joann Fabrics). I opened it for the first time this spring, and was dismayed to find that it only goes up to pattern size 18. I was probably a 16 when I bought the pattern, but now I am a 20. 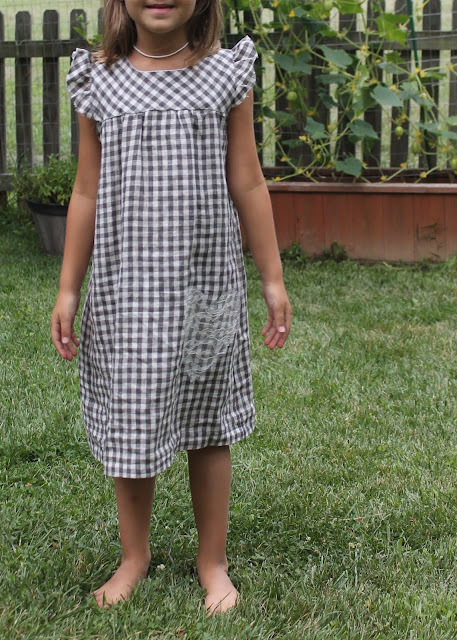 I almost threw in the towel right there, but I only needed to grade up one size, and the pattern only has four pieces. So if I was going to learn to grade, I really couldn't find an easier pattern to start with. It wasn't hard - I just slashed each pattern piece vertically and widened it 1/2" for a total of 2" increased all the way around. For my first version, I used a "Famous Maker" stretch twill snagged from the remnant bin at Joann's. It's really nice stuff - substantial, but stretchy, with excellent recovery - and has done well in the washer, too. I made up the pattern as written, except I did not interface the facing. I was out of knit interfacing and I wanted to preserve the stretch in the fabric. This allows me to push the skirt down a little lower to make it fit better, and I don't miss the interfacing at all. I accidentally cut view B (above the knee) instead of view C (just below the knee). So, instead of hemming, I finished the hem with some ready-made hem facing, inherited from my grandmother's stash. I know you're not supposed to use "vintage" thread; hopefully the same prohibition does not apply to Wright's Hem Facing. Because of the stretch in my fabric, I ended up taking it in almost as much as I had graded out. After I made it I mentally noted that perhaps I didn't really need to grade up at all. This skirt involved a lot of blind stitching. The pattern calls for both the waist facing and the hem to be blind stitched. I think I spent as much time on the blind stitching as I did on everything else put together - including the pattern grading! It was worth it, though - I wear this skirt regularly, almost every week. 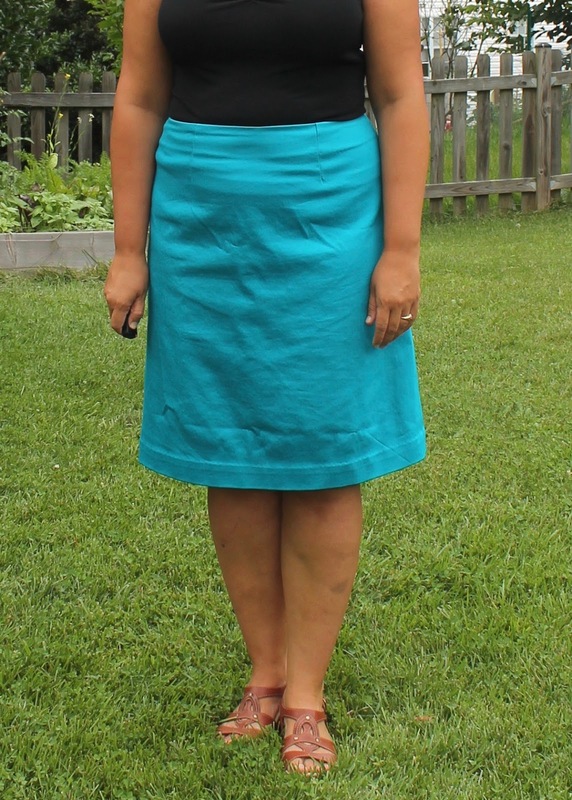 So last week I made a second skirt. I used this very stretchy fabric and made a straight size 18. I skipped interfacing the facing on this skirt, too, because I wanted to preserve the stretch. It ended up fitting me way up higher on the waist than I thought it should have based on the adjustments I made to the animal print skirt. I didn't really want to have to ease any width into the facing, so I ripped it out and resewed the facing together with 1/4" seams. This improved the fit a little, but I would prefer if the skirt sat an inch or so lower. Also, because of how high it sits, the back darts are about an inch too short. Finally, I drafted and cut out inseam pockets, but then I totally forgot to put them in, and I wasn't motivated enough to rip out my side seams to do so. I wore it to church on Sunday and really missed the pockets, though. In making this skirt, I have come to the realization that I will have to add a new flat pattern adjustment to my routine - the full tummy adjustment. I'm pretty sure the fabric straining you see about my hips in the above photo is due to the mommy pooch on the other side of my spine. I have found a few tutorials explaining the mechanics of the adjustment, however, it seems like there's no way around making a muslin before you can figure out how much adjustment you need. For FBAs, I find I can make an educated guess just by measuring the pattern, and then am able to adjust the pattern fairly accurately before I even sew a muslin. But for the full tummy, I've not found anything online that tells me what to measure and how much I need to add for such-and-such a measurement. (If you know otherwise, I'm all ears!). This skirt was a bit less successful than the first one, which I have worn probably three times a month since making it. In taking these photos I also realize that I prefer the length of the first one, so I may go back and hem this one a smidge shorter. However, I love the color of the fabric (to which these photos do no justice - it is a vibrant turquoise with a great depth of color to it) and will wear it regularly, probably with my shirt untucked. I won't be making any more of these until I can figure out the full tummy issue, though.